The National Science Foundation (NSF) has awarded $500,000 in funding to an interdisciplinary team of Colgate faculty, led by Associate Professor of Biology Catherine Cardelús, to continue investigating the status and conservation of sacred forests in Ethiopia’s northern highlands. Christian Orthodox churches emerged in Ethiopia some 800 years ago. Today, thousands of these sites protect some of the region’s last remaining native forests, which stand out in a landscape otherwise dominated by agriculture and rangeland. Sacred forests have survived in spite of changes in societies and the ways in which humans use their land. She is joined on the project by Peter Scull, associate professor of geography; Peter Klepeis, professor of geography and geography department chair; and Carrie Woods, former visiting professor at Colgate, now visiting professor of biology at the University of Puget Sound. The team has also hired two scholars — Ethiopia historian Izabela Orlowska and Alemayehu Wassie, a forester and Christian Orthodox Tewahido Church priest — to operate full-time in country. 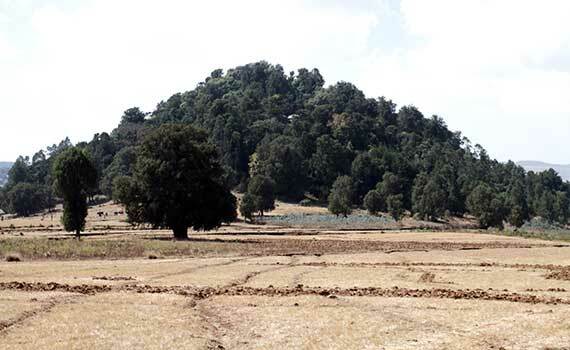 Scull will use geographic information system technology, declassified reconnaissance photos, and satellite images to track changes in the quantity and extent of Ethiopian church forests since as far back as the early 1930s. Klepeis will survey community member’s perceptions of the forest while Cardelús and Woods will measure the ecological health of forests by studying the vegetation and analyzing the chemistry of the leaves and soils. The NSF has designed its grants specifically to spur such cross-divisional investigation — and to encourage the education of the next generation of scientists. A dozen Colgate students will have a chance to travel to Ethiopia with the team during the next three years. Plans are already underway for a trip to Africa this March. 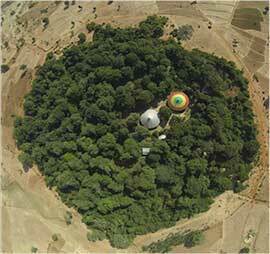 Cardelús first climbed into Ethiopian forest canopies back in 2009, thanks to a grant from Colgate’s own Picker Interdisciplinary Science Institute. Additional Picker funding backed research that laid the foundation for the team’s NSF application. “The Picker seeds interdisciplinary projects with money to enable teams of researchers like us to gather preliminary data and begin to set up research collaborations,” Scull said. Preliminary data have led to a series of intriguing questions that Cardelús’ team — and the NSF — would like to answer. “There are a lot of people out there who say that church forests are disappearing, and our research is showing that they are not,” Klepeis said. In fact, according to the group’s early findings, only four forests out of a collection of more than 1,000 have been lost since the 1960s. In some cases, the forests are actually expanding. But Klepeis also notes that while most forests persist there are indicators of degradation, such as an increase in canopy openness and an increase in exotic species. How can forests be holding fast or even growing since the 1960s in spite of villagers’ urgent needs for fuel and other products that woodlands provide? Do younger, more secular Ethiopians look upon forests in the same way as their more religious elders?